The countries that make up two thirds of the world’s agricultural output are experiencing drought conditions. Whether you watch a video of the drought in China, Australia, Africa, South America, or the US , the scene will be the same: misery, ruined crop, and dying cattle. As I have previously written, China is facing hyperinflation , and this record drought will make things worse. China produces 18% of the world’s grain each year. California is facing its worst drought in recorded history . The drought is predicted to be the most severe in modern times, worse than those in 1977 and 1991. Thousands of acres of row crops already have been fallowed, with more to follow. The snowpack in the Northern Sierra, home to some of the state’s most important reservoirs, proved to be just 49 percent of average. Water agencies throughout the state are scrambling to adopt conservation mandates. The Texan drought is reaching historic proportion . Dry conditions near Austin and San Antonio have been exceeded only once before—the drought of 1917-18. 88 percent of Texas is experiencing abnormally dry conditions, and 18 percent of the state is in either extreme or exceptional drought conditions. The drought areas have been expanding almost every month. Conditions in Texas are so bad cattle are keeling over in parched pastures and dying. Lack of rainfall has left pastures barren, and cattle producers have resorted to feeding animals hay. Irreversible damage has been done to winter wheat crops in Texas. 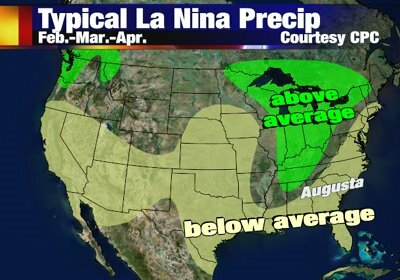 Both short and long-term forecasts don’t call for much rain at all, which means the Texas drought is set to get worse. The worst drought in half a century has turned Argentina’s once-fertile soil to dust and pushed the country into a state of emergency. Cow carcasses litter the prairie fields, and sun-scorched soy plants wither under the South American summer sun. Argentina’s food production is set to go down a minimum of 50 percent, maybe more. The country’s wheat yield for 2009 will be 8.7 million metric tons, down from 16.3 million in 2008. Concern with domestic shortages (domestic wheat consumption being approximately 6.7 million metric ton), Argentina has granted no new export applications since mid January . Africa faces food shortages and famine . Food production across the Horn of Africa has suffered because of the lack of rainfall. Also, half the agricultural soil has lost nutrients necessary to grow plant, and the declining soil fertility across Africa is exacerbating drought related crop losses. The Middle East and Central Asia are suffering from the worst droughts in recent history , and food grain production has dropped to some of the lowest levels in decades. Total wheat production in the wider drought-affected region is currently estimated to have declined by at least 22 percent in 2009. Owing to the drought’s severity and region-wide scope, irrigation supplies from reservoirs, rivers, and groundwater have been critically reduced. Major reservoirs in Turkey, Iran, Iraq, and Syria are all at low levels requiring restrictions on usage. Given the severity of crop losses in the region, a major shortage of planting seed for the 2010 crop is expected. These inventory numbers are dangerously low, especially considering the horrifying possibility that China’s 60 million tons of grain reserves doesn’t actually exists .